Rescue workers run for cover as the Volcan de Fuego, or "Volcano of Fire," blows more clouds of ash in the El Rodeo hamlet of Escuintla, Guatemala, Tuesday, June 5, 2018. Guatemala is in a state of emergency. 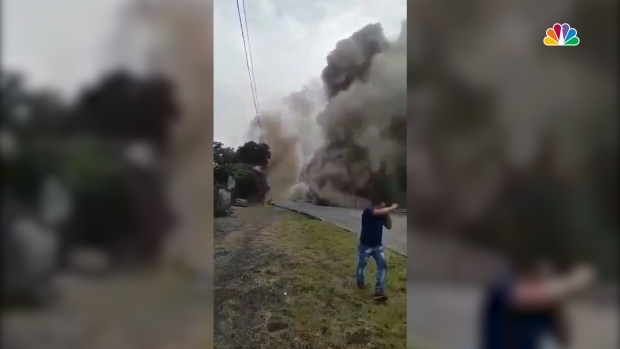 The eruption of “Volcán de Fuego” (Volcano of Fire), located less than 30 miles away from Guatemala City, has killed at least 99 people and left nearly 200 more missing. It has also forced 3,500 Guatemalans in communities close to the volcano to flee their homes and into shelters. 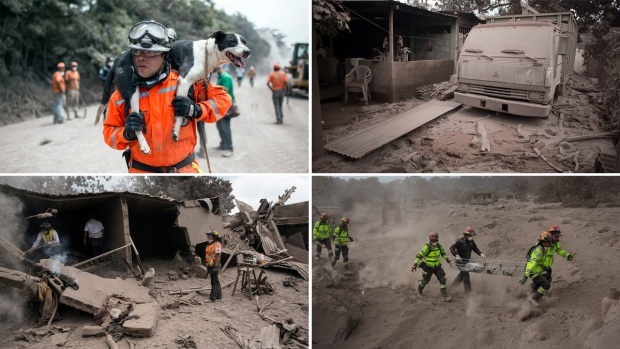 About 1.7 million people in all have been affected by Guatemala’s most aggressive eruption in over a century. President Jimmy Morales declared three days of national mourning. An eruption from one of Central America’s most active volcanoes killed at least 75 people and displaced thousand of Guatemalans. The Volcan de Fuego, or “Volcano of Fire,” blanketed nearby areas with ash and lava, affecting 1.7 million people. People all over the world have joined in solidarity with the victims using #VolcanDeFuego on social media and through organizations raising money to send urgent aid to Guatemala. Here is how you can help Guatemalans as they begin to rebuild and recover from the disaster. GoFundMe: The crowd funding site has put together a list of verified campaigns that are directing aid to those impacted by the volcano as well as relief efforts. The Red Cross: The Guatemalan arm of the organization, Cruz Roja Guatemalteca, is on the ground leading recovery efforts. Monetary donations can be made by texting REDCROSS to 90999 to give $10 to the American Red Cross Disaster Relief. Alternatively, you can also donate directly to Cruz Roja directly through the bank information found here. The organization is also seeking blood donations and specific good donations, including water, food, diapers and latex gloves. The God's Child Project: The North Dakota-based charity has opened an emergency center for burn victims and orphaned children in Antigua, Guatemala. The organization says it expects to feed, clothe, shelter and provide medical assistance to thousands of people in the coming weeks. Donations can be made online here or sent to Emergency Relief, PO Box 1844, Bismarck, ND 58502. B Strong:"Real Housewives of New York" star Bethenny Frankel announced Tuesday on Twitter that her organization B Strong is mobilizing on-the-ground relief efforts "as we speak." B Strong Disaster Relief works with the national disaster relief charity Delivering Good to provide people affected by natural disasters with much-needed gift cards, bank cards and critical supplies. To allocate donations to Guatemala's efforts, visit bethenny.com/bstrong and write "GUATEMALA" in the "additional comment" field on the donate page. Frankel has also been involved in relief efforts in Puerto Rico since Hurricane Maria. Helps International: The nonprofit organization located in Guatemala City provides programs in healthcare, education and economic development. The team is on the ground in affected areas distributing water filters and eye medications. One-time donations or monthly commitments can be made online here. Catholic Relief Services: The international humanitarian relief and development organization of the U.S. Catholic Church is coordinating with government and local organizations, including local churches, to provide food, water, medicine and other lifesaving relief items to those impacted by the disaster. CRS has also opened three shelters for the displaced, and the number of people seeking refuge continues to grow. Online donations can be made here. Raise Awareness: In addition to monetary donations and goods, you can raise awareness on social media. The hashtags #VolcanDeFuego, #PrayForGuatemala, #GuatemalaEstoyContigo and #AidGuatemala have helped bring attention to the devastation caused by the volcanic eruption.